Former Bournemouth player John Williams feels the club will still be promoted, despite the side losing their last four League One games. The Cherries moved to the top of the table on 12 February but have lost every league game since. They now lie seventh and two points adrift of the play-off positions, but Williams, who made over 100 appearances for the club, is still confident. "Yes, I'm sure they can win promotion," he told BBC Radio Solent. "This could be their little blip. If they go unbeaten from now until the end of the season then of course they will be there or thereabouts for automatic promotion - or if not definitely [then] the play-offs," added Williams, who now works as a summariser for BBC Radio Solent. The Cherries host league leaders Doncaster on Saturday and Williams says the squad need to retain the belief that they are good enough to go up. "Their characters needs to come through and remember they have not played badly, the group need to stay together and stay positive," Williams added. "The boys will be chomping at the bit for Saturday's game as they will want to turn things around. 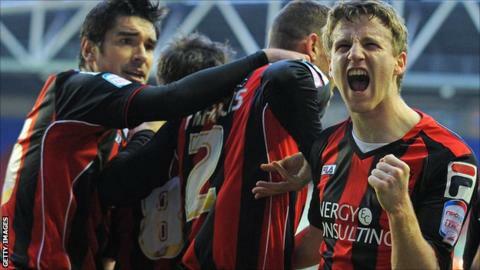 "Bournemouth are not out of it - one win and they are back on track. They are not out of the race by any means and even if they lose on Saturday they will not be out of the race, although it will make things difficult." The Cherries had climbed from the relegation zone on their rise to the top of League One, losing just one league match in 21 games. And Williams admits the past four results have been unexpected, but says the Cherries' recent run of defeats is nothing more than a blip. "It [promotion] may not be in the way we all thought," he said. "With the run they were on you couldn't see things going wrong, but little blips, suspensions and injuries happen to all teams. Let's just hope they are getting theirs out the way now and can get back on track on Saturday. "This is the time when everyone pulls together. Bournemouth have not become a bad team in the space of four games, they are still an excellent side."